On the bench in front of me is a half-empty printed circuit board in a vise, that I am not working on right now, and a just-finished one, which I am. It is supposed to be a QRP antenna tuner, a piece of gear that matches antenna impedance, which can vary, to an unchanging radio impedance. While a careful physical inspection of my work doesn’t reveal any misplaced parts, solder bridges or other assembly calamities, the tuner isn’t tuning. It is doing nothing other than being about as passive as any grouping of passive components I’ve ever worked with. Signal in, nothing out. I have a suspect or two. This kit involves winding and installing toroid inductors, something I’ve never done before. The instructions are straightforward but the details are daunting: counting turns of wire around a tiny ferrite donut, with taps along the way and making three sets of overlapping windings. I find it easy to miscount turns or put a tap in the wrong place and getting the enamel insulation off the 24 AWG wire so the coil can be soldered into the board at five points is a real challenge. Unlike most components — capacitors, transistors, switches, lights — that a kit builder buys in ready-to-use form, inductors usually arrive as a ferrite core of some sort and a bundle of wire. 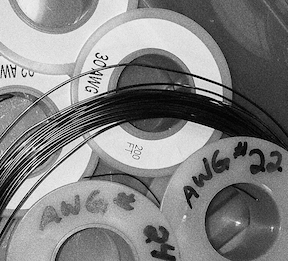 The sight strikes fear into the heart of a new builder: winding inductors has such a longstanding reputation for being difficult that there are folks who get paid to make them for hams that don’t want to make their own. I am not one of those hams. So far. Since getting my license, I’ve built half a dozen small kits like this antenna tuner. When I figured out that I wanted to explore home brewing, it seemed better to start with gear that someone else had already designed and which works if built as instructed. Kits provide a gentle introduction (or in my case re-introduction) to schematic reading, soldering, electronic components identification and all the other things that make up the how of building electronic gear. Kits were a good entry point for me; though I’ve had to do rework on every project, I’ve not had an unfixable failure. Yet. This time, though, I am stumped. After trying and failing way more than once to correctly wind and install the two inductors in this kit, I am starting to think it’s time to call a toroid whisperer. I didn’t account for left vs right handed winding consistently, so some of the wire ends finished on the wrong side of the coil. I miscounted (twice) the number of turns to a tap. I wound one of them correctly (I think) but didn’t get all the enamel insulation off two of the wires, which I figured out after I had soldered three others in place. I am not sure what other variety of mistake is possible but it seems likely I will discover them all before I get this thing to work. Toroid winding is a lesson in accuracy, patience and letting go. Especially letting go. When I find it hard to admit that I’ve made a mistake — like I did while winding these inductors — I end up investing a lot of time and energy making less-than-well-thought-out repairs. Let me spare the new toroid winder some pain: trying to fix a badly wound toroid is always a mistake. Even if you manage to move the tap into the right position or whatever — which is hardly ever possible – the end result inevitably has some other kink or nick that will haunt you later in a much harder to find way. The only thing than a not-working toroid is one that sorta works. So… lesson one is admitting when I’ve bungled something, stepping back from it, and almost always, starting over from step one. Winding toroids also teaches that accuracy is paired with patience. Twenty-two turns is not twenty-three or twenty-one-and-one-half. Ending up inside the toroid is not the same as outside. When you make an inductor, if you get it wrong, the circuit doesn’t work as it should or doesn’t work at all. And the only way to get it right is to work slowly, methodically, and patiently. It is difficult to count turns or get wire to lie flat if you are in a rush and easy if you aren’t. A well-made toroid inductor is a physical manifestation of accuracy borne of patience: it has the right number of turns going the right distance around the donut with the right spacing. It looks like it was done by somebody who cares about doing things right as surely as one that doesn’t says the opposite. The inductor sitting in front of me, which I have clipped off of the printed circuit board, does not have this look. I can see where I rushed the winding: it isn’t evenly spaced and doesn’t lay flat against the toroid. Under a magnifier I can also see where I left enamel on two of the leads, which means they weren’t making good contact in the circuit and at least two spots where I kinked the wire trying to correct the winding direction. After clearing the printed circuit board through holes of the wire bits and solder left when I removed the inductors, I set it aside and start clipping the wire from around the each toroid. I will work on them during tomorrow’s bench session, after I read the instructions again, study the drawings and track down a fresh roll of wire. I will set aside an hour for each, rather than fifteen minutes, and check all the connection points with a meter before I solder either of them onto the board. I figured out a way to check the windings for direction and count: make a photo of the finished inductor, print an enlarged copy, and tick off the windings with a pen. I imagine that this approach will greatly improve the chances of my antenna tuner tuning. Maybe I won’t need the whisperer after all.